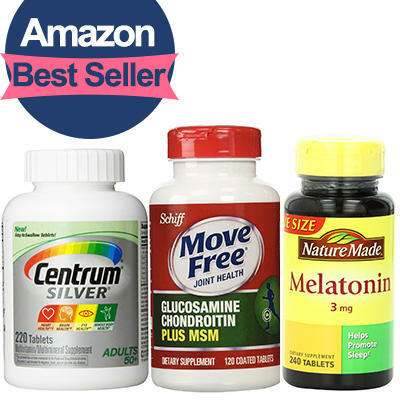 Amazon provides a great selection of vitamins and nutrition products, we pickup the best sellers for you. #1 Best Seller in Chondroitin & Glucosamine Combination Nutritional Supplements! Move Free Glucosamine Chondroitin MSM and Hyaluronic Acid Joint Supplement, 120 Count for $14.69. [Out of Stock]Centrum Silver Multivitamin Supplement, Adult, 200 Count for $14.04. #1 Best Sellerin Fish Oil Nutritional Supplements! NutriGold Triple Strength Omega-3 Gold, 180 Softgels for $36.99. Eden Pond Queen's Magic Bee Pollen Capsules, 120 Count when check out via Subscribe & Save,and activate 35% off clip coupon for $18.02. #1 Best Sellerin CoQ10 Nutritional Supplements! Doctor's Best High Absorption Coq10 w/ BioPerine (100 mg), 120 Soft gels for $15.36 when check out via $16.17. #1 Best Sellerin Grape Seed Extract Nutritional Supplements! BRI Resveratrol Capsules 30 Day Supply, for $23.88. #1 Best Sellerin Omega 3 Nutritional Supplements! SmartyPants Vitamins Gummy Vitamins with Omega 3 Fish Oil and Vitamin D, 120 Count for $17.9. #1 Best Seller in Multiple Vitamin-Mineral Combination Supplements! Vitafusion Women's Gummy Vitamins, Natural Berry Flavors, 150 Count for $9.74. #1 Best Sellerin Medicinal Sleep Aids! Nature Made Melatonin Tablets, Value Size, 3 Mg, 240 Count for $5.46 with clip coupon, and check out via Subscribe&Save. #1 Best Sellerin Diet Kits & Systems! 100% Pure Garcinia Cambogia Extract with HCA, Extra Strength, 180 Capsules for $19.99.